My Uncle Albert started doing genealogy on my maternal lines long before me. When asked, he would bring out a book of names, dates, and photographs and let me look (carefully!) through the pages. There was one picture that always stood out to me, that of a dapper looking young man in a long coat, hat, gloves, and holding a clarinet. The story behind the photograph was that Clarence (my great granduncle) left Pennsylvania to seek out his fortunes in the West but was never heard from again. This would have been around 1910. Sometime later, I also learned that Clarence had borrowed money from family members before disappearing. Nobody could tell me what happened to him; most of my surviving family didn’t even remember him. Once I started doing my own research, I was determined to learn what happened. As of today, I have finally succeeded! Sadly, everyone that might have cared or been interested, has passed on. Since I can no longer tell my uncle, grandfather, grandaunt, or second cousin 2x removed… I’ll share the mystery of Clarence Channell with you. Years later, I found Clarence in the 1930 Federal Census, sitting in the Colorado State Penitentiary. There was no data indicating why he was there; his name was accompanied only by the relation “Inmate”. After some searching, I discovered that the Colorado State Archives has extensive prison records. Indexes of these records are available online. After some quick searches, I found a number of hits: Clarence Channell #9694 (1915), G. C. Channell #11163 (1921), G. C. Channell #15192 (1929), and G. C. Channell #17246 (1932). I couldn’t be 100% sure that each of these belonged to my great granduncle, but my curiosity was piqued. This year, for Christmas, I decided to give myself a gift of uncovering Clarence’s story. According to the Social Security Death Index, he died in 1966, so it’s not like he would care. I submitted my request online and talked to one of the archivists on the phone about what I wanted. One credit card transaction and a week later, I now have a much better idea what happened to Clarence Channell. There may be court and police records that give more insight into his crimes, but the paperwork I have paint a fairly good picture, Great Granduncle Clarence was a grifter. On August 23, 1915, Clarence was convicted for “Forgery” in Boulder County, Colorado. He was sentenced to one to two years. He was paroled on July 24, 1916 and discharged May 14, 1917. On January 20, 1921, Clarence was convicted for “False pretense” in Larimer County, Colorado. He was sentenced to eight to ten years. He was paroled on January 10, 1925 and discharged January 14, 1925. Governor Sweet commuted his sentence from six years to ten years after a violation of parole in May 1926. On July 18, 1929, Clarence was convicted of “Con” in Grand County, Colorado. He was sentenced to three years and discharged on November 12, 1932. Finally, Clarence was convicted for “False Pretenses and Confidence Game” on October 18, 1932 in Denver County, Colorado (possibly while on parole). He was sentenced six to ten years. 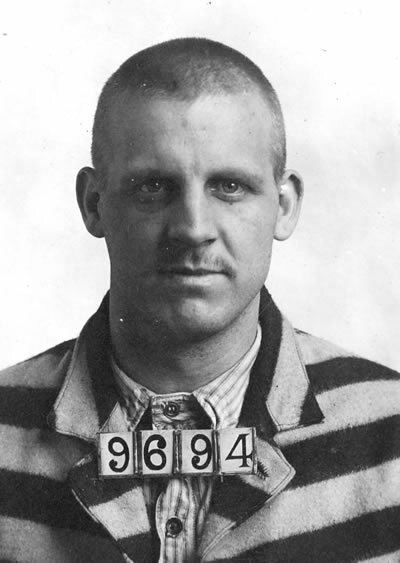 He was paroled on July 18, 1935, returned for parole violation on January 1, 1936, and finally discharged on May 5, 1937 after Governor Johnson revoked his parole. After 1937, Clarence’s name pops-up at the Denver Superior Court. In November 1960, a Writ of Error, i.e. appeal, was dismissed due to a failure to prosecute. Somewhere beneath all these dates lay some very interesting stories. I guess the lesson here is not to trust men bearing clarinets.